Hire Candy Floss Machine, Fun For All. Offer your guests the number one most popular treat, candy floss, fairy floss, cotton candy, papas beard,suikerspin or ghosts beard. Every nation seems to have its own name for it but it all refers to the magical spun sugar dessert. Made using an electric machine that heats and melts sugar. Then spinning it through tiny holes to create that fluffy spider web confection that everyone loves. Candy floss is great for weddings, parties, college balls and corporate events. Candy floss is also becoming popular in other arenas, many high end gin and prosecco bars offer it as a garnish in their drinks, and some brides are even carrying candy floss bouquets! Add Popcorn Machine Hire To Double The Fun. One of our most popular fun foods options is to add popcorn. Which can be supplied together on the same cart. Although ice cream seems to be a bit of a rising star when it comes to additional options. One operator can operate and serve both items, reducing the price for you, but giving your guests twice the treat. Popcorn can be supplied, sweet, salted or in various gourmet flavours. The Real Secret Behind Candy Floss. Most people will talk about melting points of sugar, centripetal force etc. But thats just a cover story. In the bottom of each machine ( cotton candy machine if you are American), lives a band of happy goblins, merrily taking the sugar and knitting it into the fluffy sweet confectionary we all know and love. Our operator then twizzles a stick to collect the floss. Flavoured Candy Floss Machine Hire. Fluffy magic floss is often booked for the children, but ends up being enjoyed by guests of all ages. Watching the candy floss being made is almost as much fun as eating it and never fails to amaze the younger guests. 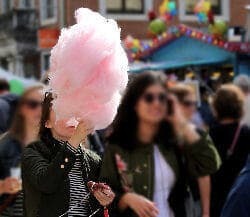 For those who are worried about the health concerns with candy floss, although it is basically just flavoured sugar, it is more air than sugar. Indeed a standard serving has far less sugar than a soft drink. We can design and build a completely one off custom structure for sales promotions or exhibition use. It also possible to supply floss in branded tubs as part of a sales promotion or exhibition. Themed carts are available for holiday events such as Halloween, Christmas, Valentine etc. It was invented by a dentist! First sold for 25c, the equivalent to almost $7 today, or in pounds of the realm, it first sold for 5p, the equivalent today of £5.90. At the St Louis Worlds Fair, they sold 68,655 boxes of floss for a total of $17,163, equivalent to $478,025 today. 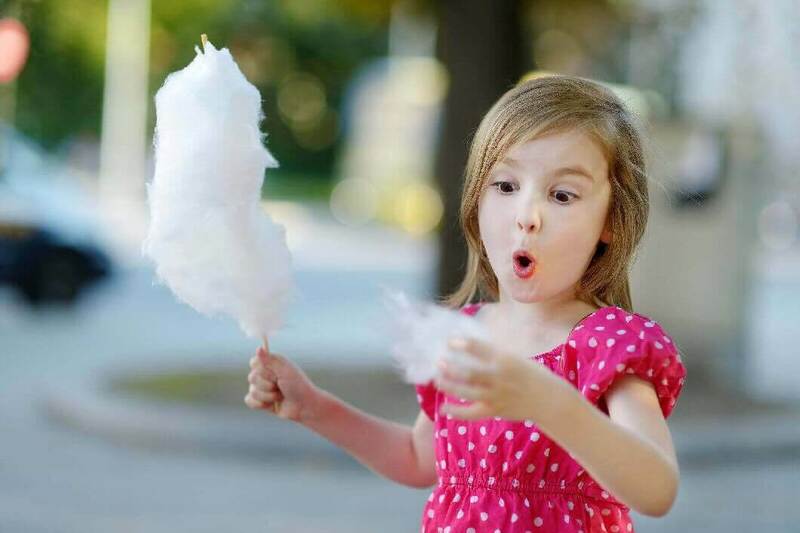 Threads of cotton candy are thinner than the human hair. In 2009 someone invented a fairy floss vending machine. The worlds longest floss came in at 1,400 metres, and took 6 hours to make. Street vendors in China, use it to create edible artworks. A typical portion contains less sugar than a can of soda. Todays machines, use basically the same technology as when it was first invented. Power Standard Power Socket Required. Combine sugar, syrup, water, food colouring into a saucepan over medium heat, stir until sugar is dissolved. Line your workspace with parchment, place paper covered tubes on it. Hire Candy Floss Machines throughout Lancashire, Yorkshire, The North East, The Midlands, Scotland, London and the rest of the U.K. and Europe and are suitable for parties, weddings, corporate events, college balls, university balls, military events, company fun days and exhibitions. Candy Floss Hire, Fun For All. The number one most popular treat, candy floss, fairy floss, cotton candy, papas beard, or ghosts beard. Every nation seems to have its own name for it but it all refers to the magical spun sugar dessert.